Best Book Direct - Flash Sales Without Exposing Yourself! Alongside the OTA's Flash Sales have been the second biggest dilemma in 2012 - they provide volume but at what cost? Exposing hotels to downward price, reduced value, compromised service and often disappointed guests. How can you use the good and eradicate the bad? Flash Sales are Best when Booked Direct of course! The principle concept behind flash sales is nothing novel or revolutionary it's just the delivery mechanism that has allowed them to flourish so prominently. The idea of selling (often distressed or dated) products and services at a reduced cost for a limited period of time is the basis for all good promotional activity. The window of opportunity to buy must be short -emphasising the need for immediacy of purchase - and the availability of product needs to be limited - scarce offers sell quicker!. The difficult with Flash Sales promotions is that they have become the preferred method of sale for too many hotels across the UK with the clear net impact of brand erosion, reduction in loyalty, movement away from direct sales, increased telephone handling costs and a massive reduction in the contribution from the room sale itself through the punitive commissions and charges. Are they to be avoided at all costs? No is the simple answer but they should be used sparingly, VERY sparingly, and be very controlled in the inventory and pricing used. However price and date lead promotions have their place. Take the key concept of the flash sale, use it on your own website, your own distribution channels and your own marketing using your own DIRECT booking engine and you can make a Flash sale stack up pretty well. 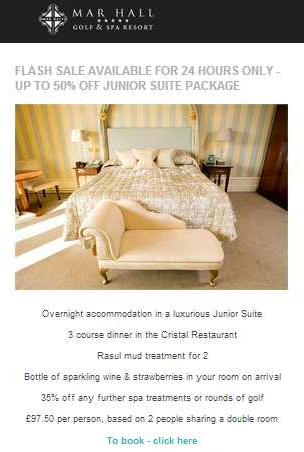 To highlight this we've used an example this week from Mar Hall Resort near Glasgow using Bookassist Web Booking Engine to drive business to a specific January offer on Junior Suites. They have previously used multiple third party channels to promote their product with varying costs associated but earlier this week decided they would try a January Flash Sale via their own website, mailing lists and social media channels using their own booking engine Bookassist. As we've highlighted before it is essential that you gather your guest data whenever and wherever you can. The lower cost of repeat business against new has always been recognised and with specific time based promotions being sent directly to the target market who already know you, your campaign is going to have an infinitely greater chance of conversion. The email campaign on the right was put together by the hotel, the package loaded up into the booking engine, availability updated and rate changed. The mailshot went out at 12 Noon with details on the offer, the restrictions and a direct link to the Booking Page for the offer. The landing page can be all important for the guest booking. If you don't take the time to land them properly they may just bounce off! Literally! Taking them to your home page is just laziness and they will be less likely to click through all the dates, choice of rooms and offers available. Landing them on the booking page is an improvement but still leaves the potential guest searching for the offer you have sent them. Still lost conversion here. Best practice should land the guest right on the offer's booking page itself. it saves guest time, it leads to less confusion and it undoubtedly leads to higher conversion. Bookassist provide deep links directly to specific groups of offers, packages or even specific date driven offers such as Mar Hall's to the left. When the guest's curiosity was engaged by the mailshot they were then clicking directly to the point of purchase. It is not rocket science or complicated marketing theory here! You are simply making it easier for the potential customer to move through that old flow from Awareness, Interest, Action and Desire. Simple stuff really. Ask Mar Hall! Revenue Manager Sharon Mullen outlines the results. "We put the email together with our marketing company at the beginning of the week and contacted Bookassist to ensure that we were maximising the promotional activity. The specific package was then given a price group which allowed our marketing company to link directly to the booking page from the mail itself. The email went out at twelve o'clock and in the first three hours it generated more than £11,000 in January Room Sales for a single package! The great thing about it was that we didn't have to man up phones as we would for an external promotion as the bookings were being made using live availability and being confirmed online. The cost of sale was minimal and the return on investment superb and they were OUR customer booking direct! At nearly £20,000 in total, the bookings using Bookassist over the twenty four hour period have exceeded our expectations and the process in doing it ensures that we will repeat the direct links for future golf breaks, spa packages and special events. It just makes sense to ease the booking process for the guest and Bookassist Booking Engine allowed us to do that perfectly." It is not difficult and here would be a typical process. Identify the package - you may have already done something similar externally. Promote the direct link through tourism partners websites such as destination sites, golf clubs or attractions. Consider creating a package with them? The Best Book Direct series is being produced in conjunction with the on-line marketing team at Plan B and the award winning Bookassist Booking Engine. Email or call 01292 521404. Great news this week from our long term booking engine partners as Bookassist has won the World's Leading Booking Technology Provider award at the 2012 World Travel Awards. The prestigious prize was presented on December 12th at the 2012 Grand Finale event, which was hosted at The Oberoi, Gurgaon, New Delhi, India. 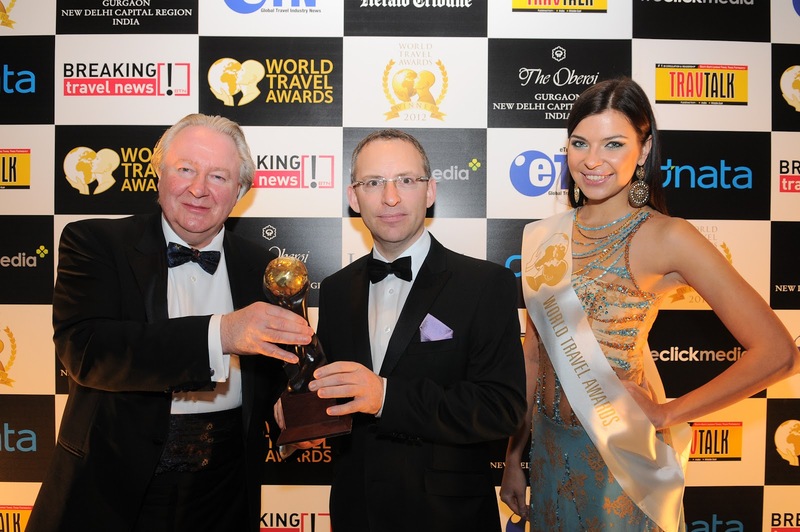 Often referred to as "the Oscars of the travel industry", the awards recognise winners worldwide as setting the benchmark to which all others aspire. It is the third year in a row that Bookassist has been nominated in the category. Speaking at the ceremony in New Delhi, Bookassist Founder and CEO Dr Des O'Mahony said "We're extremely honoured to have won, it was third time lucky for us. Especially with such distinguished competition in the category such as industry giants like Sabre/SynXis and Amadeus. It's a real stamp of approval from our own industry for what we do." "To have our client hotels and industry peers vote us into a world-leading position is testament to the hard work and dedication of the Bookassist staff, in all our offices. The award is recognition of the real difference they have made to our clients' business". Bookassist was founded in Dublin in 1999. Entirely self-financed and privately owned, it has a strong emphasis on research and innovation and has grown to over 70 employees. The company has offices in Madrid, Paris, Italy, Rome, Vienna, Prague and Munich in addition to its headquarters in Dublin. The company develops advanced booking software that allows hotels to sell directly on their own websites instead of relying solely on online travel agents, who typically charge hotels high commissions. Direct business is a strong growth area for hotels as the industry seeks to improve revenue margins and reduce commission bills. The company's booking engine software powers thousands of hotel websites and has handled in excess of 120M Euro in direct hotel booking revenue in 2012 for its clients. Asked why he thought Bookassist won the award, O'Mahony explained: "I believe it's because we deliver for our hotels. We consistently raise their direct business revenue online. We allow them capture more online business at a far lower cost, and therefore higher margin, than any of our competitors. We do this through expert consultancy and best-of-breed technology - and you need both." “This award also coincides this month with the release of a major upgrade to our hotel website booking software. Even more reason for our hotel clients to be delighted with us”, commented O’Mahony. March 2013 will be equally exciting with Bookassist’s planned release of version one of its eagerly awaited new distribution management platform to intelligently optimise the way hotels do online business. The company has previously been ranked in the Deloitte Fast 50 companies in Ireland and in Europe, and O'Mahony has twice been honoured by the Irish Internet Association NetVisionary Awards. Bookassist (http://www.bookassist.org) creates and manages consistently successful online strategies for hotels and develops world-class booking and distribution software to ensure hotels drive more direct bookings and increase direct revenue. Bookassist is the industry-leading booking engine and online marketing provider for hotels in Europe with thousands of hotels using Bookassist services. 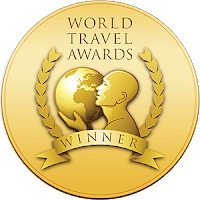 World Travel Awards (http://www.worldtravelawards.com), established in 1993, reward the very best travel organisations worldwide. Nominations are vetted and inspected by a group of industry experts and votes are cast by professionals working within travel and tourism. The voting works on a first-past-the-post system, and votes are submitted online at WTA's website. More than 5000 travel organisations are nominated each year and over three quarters of a million votes are cast. The Grand Finale 2012 event, officially supported by Ministry of Tourism of India, was hosted at The Oberoi, Gurgaon, New Delhi. 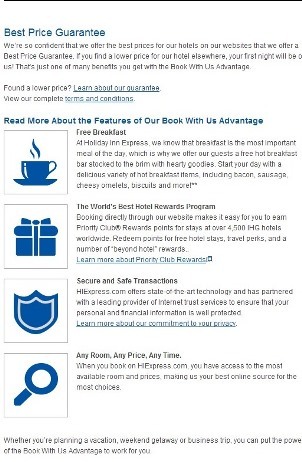 There are hundreds of pages outlining how the guest browsing and booking experience has moved from desk to mobile. We're not going to outline the arguments any more because this is not something you need to consider; it's something you need to do! Who needs a mobile website? Businesses of all sizes. Mobile is the fastest growing method of accessing hotel information online. This is not the future – it is very much the present. The Bookassist mobile version integrates the same availability that will be on your website, your Facebook (and your VisitScotland channel from June 2013) and configures it for the mobile user. Simple swipes and a couple of touches and the room is confirmed. The guest gets confirmation, can check Facebook updates and even be routed directly to the property with the integrated mapping software. You can now tell your guest just to log onto your website and they'll be automatically redirected to the mobile site and the map with directions. Customer care and added value alongside mobile bookings! The Open Rooms Mobile website is built within the Content Managed System giving you the opportunity to introduce new pages and drop them into the navigation as well as managing your late availability and rates utilising the full power of the integrated Bookassist Booking Engine and also includes mapping, image galleries and whatever additional pages and content hotels wish to put on it. Feature entire hotel groups, seamlessly interlinking each hotel. Properly built platforms drive DIRECT conversion and Open Rooms mobile will help you get your business working on the move. Activate your mobile booking strategy now with your Bookassist booking engine if your system doesn't offer mobile version maybe you should be asking some questions. It may not be the highest converting distribution channel that you have but if you're going to use Facebook for your accommodation you should utilise all the functions you can and that includes at least offering DIRECT booking from your own page. All users of Bookassist have free access to the easy to install Facebook Apps. The Suite of Bookassist Apps for Facebook gives your hotel or guest house four separate applications that are simple to install and use, and require no additional maintenance. And because the Apps take information directly from your Bookassist Hotel Admin system, you don’t have to worry about keeping your Facebook apps up to date - changes made in your Hotel Admin appear in Facebook immediately, just as they do on your own website. And it is simple to install so it really is worth taking a few minutes to do - if you're looking for a new booking engine to replace your old one you can have your Facebook bookings and exclusive offers up and running even before you get your own website live. From there choose the Bookassist App which you want to install and you will be directed to that App’s profile page. Go to the bottom of the left column on the Facebook App page and click "Add to my Page" and if requested, click the "Add to Page" button for your Hotel page. Repeat this for all of the Apps you wish to install. Once you have done this you are now ready to activate your apps. 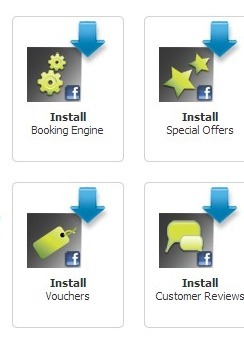 Bookassist client hotels can activate the Apps using your hotel's unique Activation Code, available in the Social Media Integration section of the Reputation tab in Bookassist Hotel Admin. Log into your admin as usual and you’ll find the Reputation tab. Click on the Social media Integration button under this heading. When you enter the page you will see an Activation Code. Simply copy the Activation Code and enter it where requested by the App in your hotel’s Facebook page. Return to your Hotel Facebook page, click on the newly installed Bookassist Apps one by one and when asked paste in the Activation Code. Your Bookassist Facebook apps are now ready and you'll see from the graphic below it's not just for the big hotels either. It's jsut as practical and convenient for the small operator. Bookassist now has a commission free booking engine option for businesses (in Scotland only) with less than ten beds and it includes FREE access to the Facebook Apps. The Best Book Direct guide is being produced in conjunction with the on-line marketing team at Plan B and the award winning Bookassist Booking Engine. You do all the work to get visitors on to your site; you shout that your rates are better when booked direct and then you don't show your availability. It is essential that you show maximum availability at all times on your website right up to the last minute. The first thing you should be checking in your booking engine admin is that you have maximum availability within your own website at all times. Your last available room should always be bookable through your own site right up to the time that you stop taking bookings. Go to your admin panel and maximise the available rooms. There is NO reason why a room should be available through a third party site or by telephone and not bookable through your website. Two clicks and you can open and close out your rooms. Remember if a room is sold online it is automatically updated in the booking engine system; it cannot be sold twice. Last minute reservations are becoming more important as mobiles take over from laptops and PCs. Bookassist's mobile version web site and booking engine allows the easiest possible route to market from a mobile device. Make your rooms available to purchase online right til the latest possible time. Remember they are mobile and you must offer what is being looked for. Utilise the Bookassist Text Confirmation service if required. Best Book Direct - Guaranteed Best Rate. Own it! Guaranteed Best Rate or Best Available Rate is the most misused and arguably most lethal weapon used against accommodation businesses across the world. But need it be? Not in our opinion. The principle behind Best Available Rate is clear; it is used by the OTA's to "assure" their customers that they don't need to go anywhere else. You need to do EXACTLY the same. Guaranteed Best Rate. The most misused and arguably most lethal weapon used against accommodation businesses across the world. But need it be? Not in our opinion. The principle behind Best Available Rate is clear; it is used by the OTA's to "assure" their customers that they don't need to go anywhere else. You need to do EXACTLY the same. We've already highlighted earlier this week how you can ensure that your webpages can promote your own Best Rate Book Direct Statement but what you can learn from is how the chain hotels have developed their own strategies to counter the third party bookings. Perhaps ironic as they are perhaps culpable for providing so many rooms at rock bottom prices in the first instance to fuel the OTA bonfire of room revenues but that’s historic. If you do search for a chain hotel near you, you will notice the difference in searching for your own business name. Quickly try searching for Ramada Inverness or Hilton Dundee or Macdonald Aviemore or Sheraton Edinburgh. No Booking.com adwords campaign on their names (destination maybe but no brand names) and they will have their own adwords campaign running invariably pushing a best rate guarantee. Fair? We don’t think so and that’s why Best Book Direct is about more than just a few blog articles; it must be about changing the attitudes of both the consumer and the accommodation owner. Anyway, we’ll look next week at whether you can get the OTA’s to stop bidding for your name and why you should set up your own Google Adwords campaign to protect your business name (however small you are) but for today it’s YOUR Best Available Rate or Best Rate Guarantee that needs sanctioned. And here you can learn from the big boys and act. We are suggesting that you look at your room rate policy and absolutely enshrine a best available rate by booking direct guarantee into your 2013 plan. No ifs, no buts, just a straightforward and clear promise with no strings attached that the customer will receive the very best rate if they BOOK DIRECT. By phone or by email you’ll match any available price online, online you’ll ensure more rooms and the best price through your own website booking engine. The best example we've found is Holiday Inns. Are you in any doubt where you would book? No. It’s clear and not only clear that it’s the best price but they are emphasising added value with their Advantages programme. Out of the above you may not be able to offer a Rewards Programme (although Bookassist web booking engine users can see below) but you can certainly emphasise the rest. What else could you guarantee? Room Upgrades to direct bookings? Discounted or complimentary add ons for direct bookings? 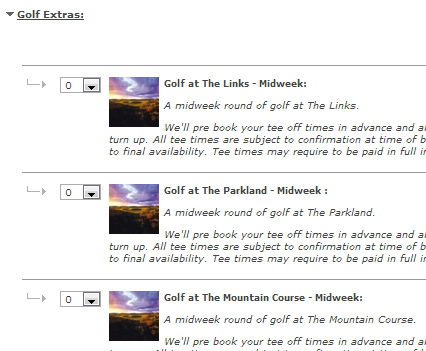 Simple things like adding a FREE morning newspaper to your online booking add ons? How impressed will the guest be? Exclusive next stay discount voucher for direct bookings? It is your business and you know your guest and there must be advantages that you can offer to increase your direct business. Ensure all staff know what your Best Rate Guarantee is and ensure that any unconverted telephone calls end with the confirmation that our best rates and availability are guaranteed on the website. Again this is not rocket science. Ten bullets points, maybe even less to ensure that you have not only levelled the playing field but have got wind advantage. Surely it’s worth the time to reduce those cost of sales. The inspiration for this morning's blog is the latest VisitScotland letter advising accommodation providers that they can now link their booking page to the tourist board's destination website. It is important - and not just for your VisitScotland entry - that you use your online booking system to the maximum and know how to land your guests onto your specific reservations page. 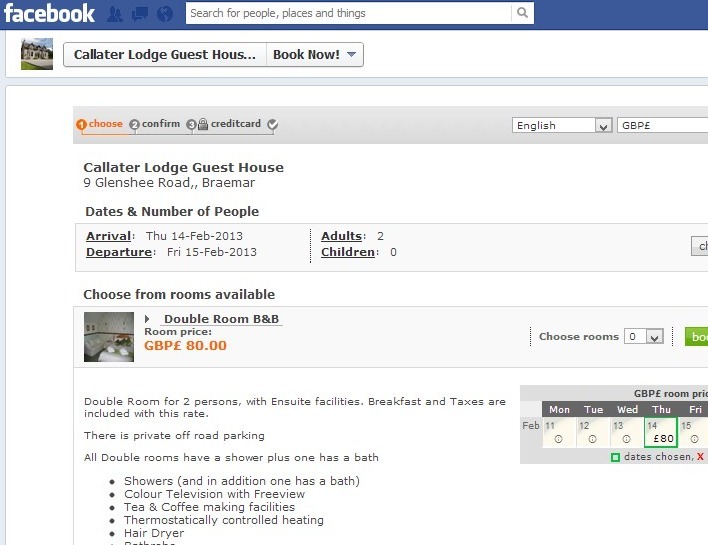 Visitscotland will be ceasing operation of their own booking engine and instead replacing the function with direct links to the accommodation providers' own booking pages something that perhaps they should have been doing for the past decade? Anyway it is happening from the 13th of December so it is incumbent upon Scottish accommodation providers to ensure that they maximise the opportunity for this new DIRECT business. So this is a very short tip today and it is just to make sure that you use your own booking page. It is best if your landing page is within your website rather than linking to another site. However you need to be careful about what link you use there are examples of booking pages where the visitor doesn't actually have a link back to your website. If that's the case you may be best settling with the poorer option of landing on your homepage. If you're using Bookassist landing on the booking page is simple as all the availability and booking information is embedded into the accommodation's own website. Bookassist believe that having your booking process embedded into your own website plays a really important role in increasing conversion rates - in situations where you're directing the booker to your booking process from a third party site it can be even more so. Normally the landing page can be easily worked out just by checking availability on your own site but if you need some assistance just mail us and we'll send you the suggested link you should use for not only the VisitScotland site but any other sites with links to your bookings pages such as the excellent Welcome to Scotland. Examples of the URL used for landing directly on your booking page. 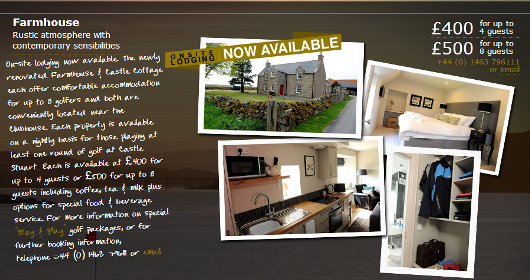 Inn at Lathones near St Andrews - http://www.innatlathones.com/booking.php? 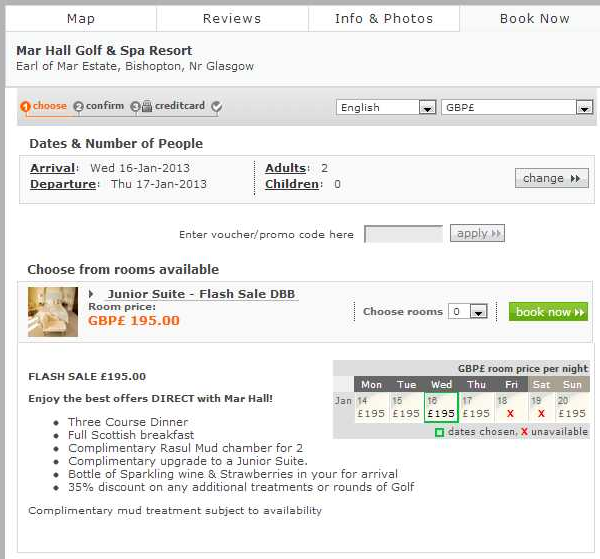 Mar Hall Golf Resort - http://www.marhall.com/booking.aspx? 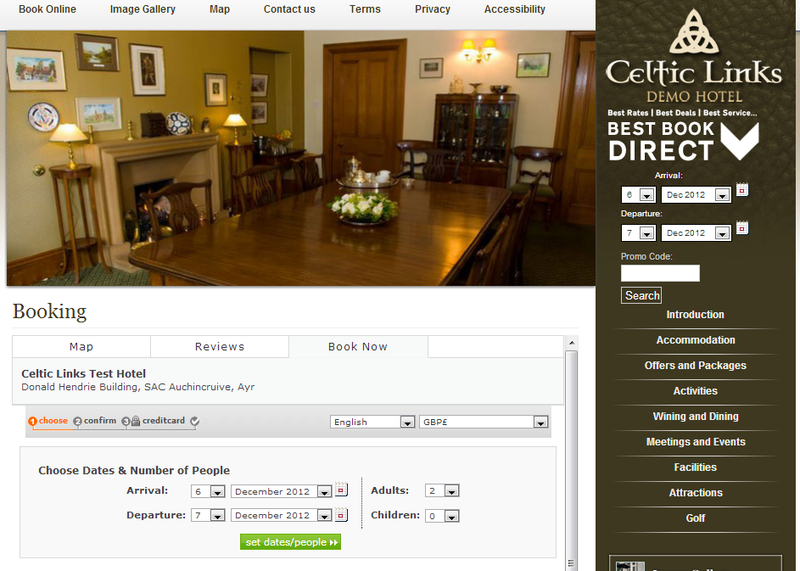 You can see from the above that your guest has landed on the page you wanted them too - the booking page! This can be taken even further with guest being directed to Special or Exclusive (public or private) offers when required. You could for example direct guest directly to a VisitScotland rate or offer from their page even including a logo to reinforce the exclusive nature of the deal. These "Price Groups" allow you the accommodation provider to direct your customers to very targeted price or added value promotions. In this instance the rate is only visible when clicking on the link. great for exclusive offers and set up in a few minutes. Try the virtual VisitScotland Offer link for yourself and imagine how impressed the customer is that you have given them a special "branded" exclusive. Check out your bookings landing page - is it on or off your website? Here's the latest advice from VisitScotland regarding the switch over next week to driving books direct to hotel's own websites. In our opinion this is the way that it should have been and should be in the future. It is therefore important that accommodation providers ensure that the link from VisitScotland is going DIRECTLY to the booking page on their website and not just the homepage. If you don't know what the URL is off your booking landing page contact your web booking engine provider for some assistance. 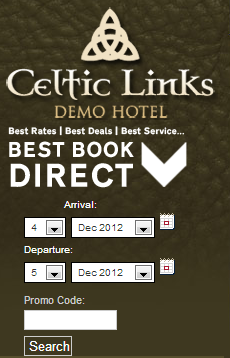 An example on our own test web site for the mythical but very competitively priced Celtic Links Demo hotel gives an idea - the customer wants to check availability and make a booking so make it easier for them. Ensure they don't have to go searching for it and use three more clicks than they have to! 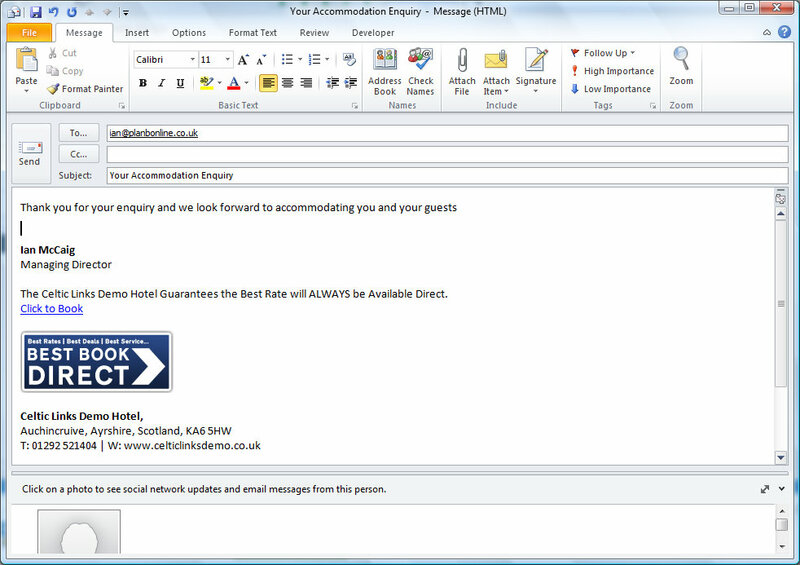 Our demo hotel uses Bookassist Booking Engine to power the online availability and the booking engine will be one of those integrating with the proposed VisitScotland availability search in June 2013. I wrote to you recently concerning forthcoming changes to the way in which bookings are processed on www.visitscotland.com. The purpose of this email is to give you further advice on what you should do in preparation for the removal of our online booking functionality (including Web in a Box) on 13 December 2012. Consumers will still be able to find your business through the search function on VisitScotland.com and it is vital that you continue to keep your details up to date, accurate and have a description that best portrays the products and services on offer to the consumer. You now have the facility to set up a link directly to your own preferred online booking website. Or continue to use the VisitScotland Contact Centre or a VisitScotland Information Centre to make a booking. VisitScotland.com is, and remains, a showcase for Scotland, boasting a rich source of information for visitors and reaching out to some 14 million internet users. Our international and UK & Ireland marketing will continue to drive visitors to the site using a range of print, online communications and campaigns all year round. Keep updating your room availability and pricing on the VisitScotland Extranet as our Contact Centre staff and VisitScotland Information Centre staff will continue to use the search facility to find available accommodation for customers. Information on how to do this can be found in the extranet user guide. If you have a property management system or online booking website we recommend that you add a direct link to your booking website - for a short step by step guide on how to add the link to your listing go to http://vslastminuteoffers.briefyourmarket.com/Goto/90987-1257-HRZYIG . If you do nothing just now, you can still receive booking enquiries via telephone, email and links to your own website. In this case, we would only advise that you ensure your contact details are up to date. If you would like to talk through these changes in more detail, please call one of our Advisors on 0845 602 3779 (available Monday - Friday 9am - 5pm) or email updates@visitscotland.com. From June 2013, our national tourism website, http://vslastminuteoffers.briefyourmarket.com/Goto/90987-1258-0NYTTY will offer integration with a number of accommodation booking systems. If you use one of the systems that integrate, then your own pricing and availability will display on visitscotland.comdirectly from the third party booking website, and the customer will be able to book your room online instantly. A selection of property management systems (PMS) has been published on our corporate website here. This is not meant to be a definitive list, so please use it as a guide only. A confirmed list of supported PMS providers who are planning to integrate with VisitScotland.com from June 2013 will be published on this page from the end of January with additions made throughout 2013. Converting more direct business through your own website is not done with a single large change in strategy but just a whole lot of small and sometimes very obvious actions. So the very simple consideration today is how to make the most of your outgoing emails. Accommodation providers need to use every possible channel of communication to get the message across that booking direct provides the best rates, the best deals and the best service. The message should be on all printed materials, it should be on every invoice you issue to departing guests it should be on every letterheading sent out. It should also be on every email every person in your organisation, however large or small, sends out every day. Every email should be a call to action. Use a graphic message to reinforce the book direct message and always embed a link straight back to your Booking Page or even a specific offer. Don't just link back to your website - take them straight to the point they can reserve online - reducing the number of clicks can increase the conversion. Keep this in mind on your Facebook, Twitter and blog pages as well. Dropping in signatures is quite easy in Outlook or your Google Mail account but even if you're not dropping in a graphic make sure there's a Direct Link. With Bookassist web booking engine you can link directly to your booking page or using Price Groups direct the customer straight to the offer, package or date. It makes it so much easier for your customer to book quickly. Try the test links below. Bookassist web booking engine allows easy management of your rates, rooms and packages and has been designed to increase your conversion rates. It is just a simple fact that customer will search third party sites looking for the best deal but that deal is not always about price it can be about value. They will look about and that does mean that very high percentages will find you on the third party site and then open your website for more information. The opportunity to switch sell your booking is being all too often lost. Capture and keep that customer and you can switch that customer to booking direct with you at a lower cost of sale. The whole thing about generating more Direct Bookings through your own website is about just doing the obvious things. We've already shown that the Online Travel Agents are bidding for your name in Google Adwords and prominently promoting a "Best Rate Guarantee" and that you need to counter that by asking them to stop, bidding against them for your own name and always making sure that your Page Title also pushes the best rate by booking on the direct and official website. The consumer is often more discerning and one bad experience on a third party website may be enough to change their behaviour permanently - they will not do this however if your price on your website is more expensive. Let's look logically at the consumer journey. In fact let's look at your own consumer journey for the last time you booked a hotel away from your own location. And the hotel website in the normal listings - it may even say Best Rate Guaranteed Book Direct in its title! But once your availability comes up and is of interest to the booker it is what the customer does next that gives the operator the chance to take that business back DIRECT. The discerning or curious customer will invariably check the the property out in more detail by doing a quick search for it. 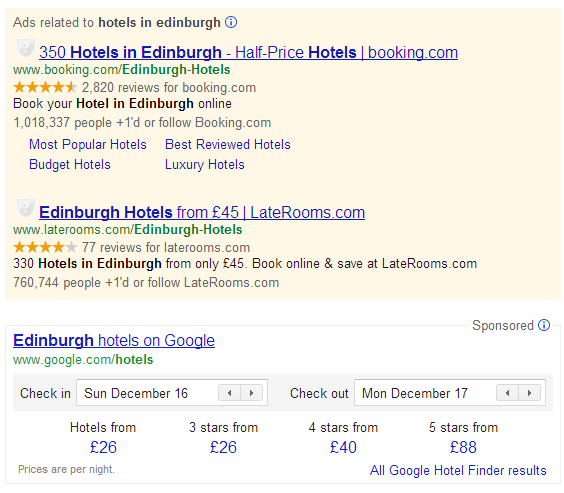 Your hotel is found but it says nothing about best rates it just says Celtic Links Hotel Edinburgh. They click on the link and open the official site. They find availability but the rate is £20 per night more expensive direct and they close it down. And it would have been so simple to switch that sale if the hotel had offered a Best Rate Guarantee of their own, ensured the prices were the same and that added value options were available. They click on the booking page and the price is the same but there are also packages that add better value. The accommodation has retained a Direct Booking, retained the customer information, reduced the costs of sale and increased the secondary spend. Does it happen this way? you are the best judge of that. Does it sound familiar in your own bookings history? Some of the best converting Bookassist clients will use every opportunity open to sell more rooms direct by adding value to the basic room proposition. Give more whenever you can and ensure that the option to book direct is given more value. Remember not all your potential guests are looking for the lowest price and as we all do, we will pay that little bit extra for the service, the extras, the personal touches. With Bookassist web booking engine you can add unlimited extras - flowers, champagne, flowers, rounds of golf, gift vouchers - to the booking process even restricting them to specific packages. All of these little extras can help the customer differentiate between booking third party and booking direct. In the eyes of many OTAs are driving accommodation providers in an ever faster Race to the Bottom and discerning operators need to start adding more value on their own direct business. They provide a distribution channel for your products but it is up to you to ensure that you are managing the balance of that relationship proactively. It is after all Best to Book Direct! Bookassist in Scotland are delighted to announce that they have entered into two great new contracts with some of the very best golf related accommodation in Scotland at Castle Stuart in The Highlands and Craigielaw in East Lothian. Both golf courses have been developing their own on course accommodation and both properties will offer the golfing visitor to Scotland an even more enhanced experience. Opening in May 2013 this is a 25 bedroomed addition to what already is a superb clubhouse and meeting facility overlooking the golf course and the Forth of Forth. Situated at the entrance to the village of Aberlady, the high quality accommodation will offer 25 en suite twin or double rooms with 13 sea view and 12 courtyard facing bedrooms. We've been working with General Manager Derek Scott in setting up the rooms, rates and availability and soon they'll be adding a range of golf inclusive offers on to the site complete with a range of guest adds which can be added to each package. 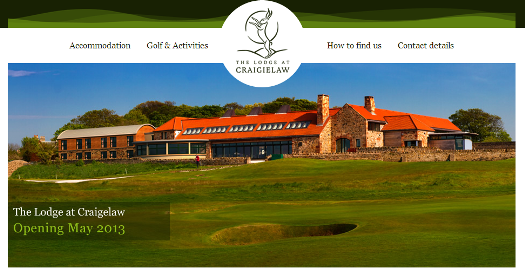 The Craigielaw Lodge website is already live and taking on-line bookings and we look forward to a great relationship with the team on the East Coast. Simultaneous to getting the booking engine live on the Craigielaw site we've been working with Stuart McColm and Steff at Castle Stuart Golf Club to create a really strong booking proposition for their wonderful new golf and accommodation product. Castle Stuart itself hardly needs much introduction as it captured the imagination of the golf market even before it opened and has hosted the Scottish Open over the past two years and will again in 2013. The magnificent course is now additionally supported not only by first class clubhouse facilities but also by three luxurious self catering accommodation offerings - Golf Lodge sleeping up to six and the Farmhouse and Castle Cottage sleeping up to eight. The flexibility of the Bookassist booking engine allowed us to configure each accommodation unit to the needs of the management and more importantly the golfer. The wonderful Stay and Play Castle Stuart packages will be bookable by accommodation type for up to eight golfers in eoither single bedded or twin rooms and then the golfers can add on the number of rounds of golf to their package. Add ons such as caddies, welcome hampers, cases of beer can easily be added onto the module as and when required to add value to the DIRECT booking experience. This blog article is presented by Plan B and Bookassist. The Bookassist Booking engine is managed in Scotland by Plan B and with nearly twenty years involvement with Scottish hospitality marketing, Plan B can provide full support for your online marketing requirements from website design, relationship building through to increased conversion with Bookassist Web Booking Engine. In our travels, in our day to day support calls and in our ongoing research we still find dozens of businesses who have found themselves immersed in a Facebook campaign yet are still without an up to date or quite often NO presence on Google Places. If your brow has just furrowed and you've just thought I'm not sure whether we're using Google Places then you really MUST read on. It is free, easy to set up and it really is an absolute MUST DO TODAY job. If there's one thing you need to check before the year's out it is that you're using Google Places to its full (and FREE) potential. We have presented at workshops all around the country and still businesses are not using the free tools that Google have given them. And to be quite brutal it's unforgivable! "You've got a Facebook account yet you haven't updated or claimed your Google Place?" Time to prioritise better! Google Places is playing an an increasingly important role in searches for the hospitality sector on both PC based searches and increasingly in Google Apps on mobile devices. It is not just important that hospitality businesses manage their Google Places account it is truly criminal not to. It's an old blog posting but Laurian Clemence, Corporate Communications & Public Affairs with Google UK highlighted the importance of Places more than a year ago, “By having an on-line presence via Google Places, hotels are enabling users to find and interact with their business,” says Clemence. He recommends keeping listings simple, accurate and consistent. From a tourism and hospitality perspective Google Places is taking, and is likely to take even more, prominence as Google identify means of improving their social media offering with search offerings such as Google+ Local, Google + Pages for your business and Google Hotel Finder. Google Place information is visible in the top right corner of the search screen - and must surely be a positive one for hotels seeking direct bookings through their own website. Once again use your own business name and see what your customer sees. 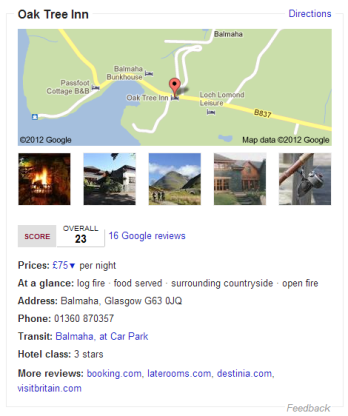 On the right is the Google Paces result for The Oak Tree Inn Balmaha. This search data is free and managed at the core by your business. It offers reviews and new ratings out of 30 based on a host of customer inputs. If your business doesn't appear in this way you really need to get this listed as an A+ priority and that means TODAY. This is not intended to be a detailed guide to how to set up Google Paces just a call to action to ensure you do. Google explain in the easiest possible terms how to do it. Do you need to understand how it interacts with Hotel Finder, Google + Reviews, Google+ pages? In time yes but for now get the building blocks in place and make sure that your business details, map, and descriptions are up to date. Upload your best most recent images and video if you have some. 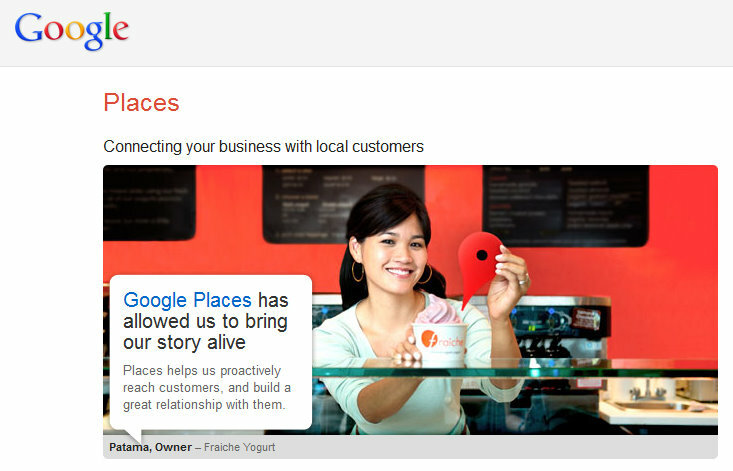 To start creating your free local business listing, go to the Google Places and sign in with your Google account. If you don't already have a Google account, click Sign up now to create a new Google account. Set up or update your Google Places account fully for each business you operate - content, images, categories, video, tags and descriptions special offers, the lot. Set an hour (or very maximum two) aside to do it properly. This article is a call to action rather than a detailed briefing. 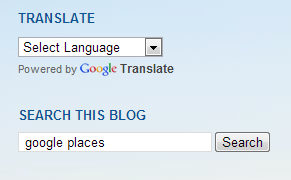 We have previously written articles on Google Places in this blog. Simply type in Google Places in the search field top right of this page for more detailed info. Google's reference guides are definitive and really easy (on the whole!) to follow so to get your entry up to date click on the links below. Search for your business name and location in Google and note the results. How are you seen, who are your partners or competitors, how is your business name represented, how does your Google Place entry look. This is your continual and ongoing reference point. Once you have your business name sorted and only then should you start moving to being found for more general terms. Start from your business out. One of the most challenging issues facing accommodation providers in 2013 and beyond is how to reduce the cost of on-line sales by switching your guests from third party websites and on-line travel agents to booking direct. We will be looking at the shady practice known as Hotel Brand Jacking later in the week at how the accommodation sector - and the industry bodies representing the sector - could and should be taking this practice head on but regardless of the way the big boys act, operators should be doing what they can for themselves in areas of search and "brand" or business name awareness. Let's start with the very basics. It seems logical to start with your own business name. You may think that it's simple - a potential customer is looking for your business specifically and they'll find you? Maybe but increasingly your name is being hijacked. Bit of an overstatement? Well if you've seen a drop in bookings over the past two years from your own website you may be blaming your website or your booking engine. The truth is that your DIRECT customer, those looking for your business, are being "seduced" or more accurately "bought" by the online travel agents running Google Adwords for YOUR business name. Let's look at an example of a smaller independently owned hotel on Loch Lomondside, The Oak Tree Inn at Balmaha. We did a Google search for their name "Oak Tree Inn"
The first thing you'll notice is that you are being shown in a number of ways. Paid advertisers will show always first; The business featured on Google map will be on the right hand side and the organic search listings will be listed below the paid adverts. 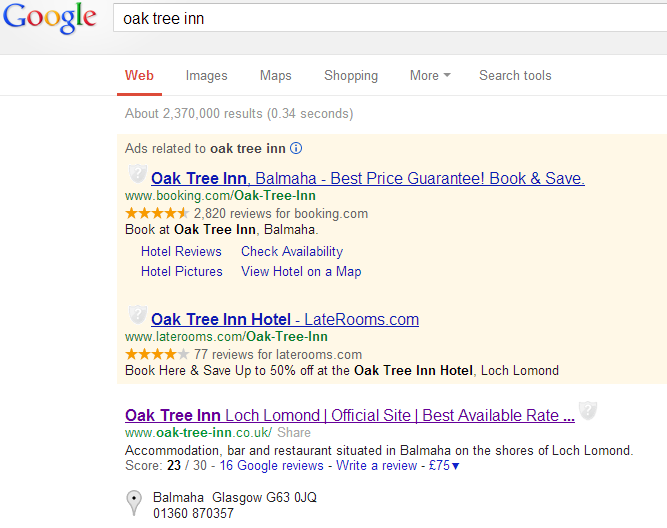 Google Search for "Oak Tree Inn" or "Oak Tree Inn Balmaha"
We'll look at how businesses can maximise their content on Google Places on the right later in the week so we'll focus on the paid adverts and the generic search listings for now. The first thing that your searchers will find are the paid adverts with the big boys buying your business name. Do your customers know that it's an advert? Do they care? Or are they going to be drawn by the Best Price Guarantee or Book & Save statement? What would you do? Go for the most likely best price? Your own website may always appear first in the general listings but what does it say to the customer? You must ensure that it emphasises that it is Best to Book Direct so while the OTA's may be able to promote Best Rate Guarantees, so should you; and only your site can claim to be the official one so why not use it. The Oak Tree Inn has done just this and there is little doubt that it helps convince the customer that they are assured of the best rates by booking direct. The series of Best Book Direct features is intended to focus businesses on the issues and actions that they DO have control over and by creating a course of small changes (some with big gains) there can be a gradual but inexorable movement toward a much more balanced accommodation reservation position. So acting on a Google search on your own business name may not be high on the Richter Scale but it is a start that states a determination to take more control of your online marketing and sales conversion. Over the next days and weeks some other equally small changes may combine to make the big differences in direct sales that all accommodation businesses need in 2013. The next few Days in the Advent Calendar will look further at maximising your Google Search opportunities and protecting your business name. Regularly revisit how your business is being found..